In Biblical Preaching and Biblical Counseling: What Makes Them Biblical?, I dialogue with my friend, David Murray. My focus in that post is on how biblical counselors use God’s Word to build the foundation for our counseling model—our biblical counseling worldview, our theology and theory of people, problems, and solutions. It is from God’s Word that we find foundational wisdom for life for building our way of thinking about helping hurting people in their daily lives. But what about the practice of pastoral counseling? When I’m sitting across from a hurting person who is struggling either with an issue of suffering in a fallen world, or with an issue of sin and sanctification, what is the relative role of Scripture in our conversation? Does Scripture only control my thinking about understanding the person, diagnosing the problem, and interacting about wisdom-based solutions? Or, can and should God’s Word play a central role in our actual conversation? Am I confident as a pastoral counselor in the power of God’s Word in the counseling conversation? Am I competent as a pastoral counselor in using God’s Word to comfort and encourage the hurting and to reconcile and guide the person struggling against sin? In light of this practical issue, I thought it might be instructive to consider Martin Luther’s practice of pastoral counseling. What did sola Scriptura—Scripture alone—look like as Martin Luther interacted with parishioners? One of Luther’s benefactors and protectors, the Elector Frederick the Wise, was seriously ill. Frederick’s chaplain asked Luther to write Frederick some words of consolation. They have come down to us as The 14 Consolations. In the superstition of the day, a shepherd had claimed to see a vision of 14 saints. As a result, sick Christians began praying to these 14 saints. Luther took the motif of the number 14, and moved it from superstition and saints to Scripture and the Savior. He presented the Elector Frederick the Wise with 14 scriptural images—7 images of Christ crucified and 7 images of Christ resurrected. Luther kept Jesus on every page of his counseling. The English version of The 14 Consolations is 45-pages long. In those 45 pages, Luther quotes 169 passages. The average small book today is about 5 times that size. So, had Luther written Frederick a small counseling manual today, he would have quoted, developed, and discussed nearly 850 passages! This is not to say that Luther’s focus on Scripture means he would have ignored science—see below on that. It is simply to say that sola Scriptura and sufficiency of Scripture played a central role in Luther’s actual practice of pastoral counseling. Luther’s words of pastoral counsel were Word-saturated. Luther was confident in the power of God’s Word. Luther always pointed people to the Word of God as their ultimate hope and primary help in suffering, sin, and sanctification. The Scriptures, for Luther, were sufficient to comfort the hurting, confront the sinning, and cheer the saint. Consider just a few examples from Luther’s various writings, where he highlights the sufficiency of Scripture for counseling the hurting. Consider just a few examples from Luther’s various writings, where he highlights the sufficiency of Scripture for counseling people dealing with sin and temptation. 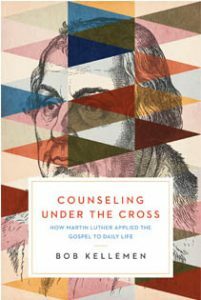 Note: The preceding quotes from Luther came from my recently-released book,Counseling Under the Cross: How Martin Luther Applied the Gospel to Daily Life. [i]Luther, LW, Vol. 49, p. 16. [ii]Tappert, Luther: Letters of Spiritual Counsel, p. 63, emphasis added. [iii]Luther, LW, Vol. 42, p. 124. [iv]Nebe, Luther As Spiritual Adviser, pp. 175-176. [v]Nebe, Luther As Spiritual Adviser, p. 179. [vi]Tappert, Luther: Letters of Spiritual Counsel, p. 117. [vii]Luther, The Large Catechism, p. 187, in Krey, Luther’s Spirituality. [viii]Nebe, Luther As Spiritual Adviser, p. 178. [ix]Luther, Commentary on Romans, pp. 179-180. [x]Luther, Commentary on Galatians, pp. 333, 126. [xi] Luther, LW, Vol. 54, p. 78. [xii]Luther, LW, Vol. 50, p. 77. [xiii]Luther, Commentary on Galatians, pp. 333, 126. [xiv]Luther, LW, Vol. 54, pp. 53-54. [xv]Smith, The Life and Letters of Martin Luther, p. 402.
https://www.facebook.com/plugins/like.php?href=http%3A%2F%2Fwww.rpmministries.org%2F2017%2F10%2Fmartin-luther-pastoral-counseling-sola-scriptura-sufficiency-scripture%2F&layout=standard&show_faces=true&width=450&action=like&font=arial&colorscheme=lightThe post Martin Luther, Pastoral Counseling, Sola Scriptura, and the Sufficiency of Scripture appeared first on RPM Ministries.